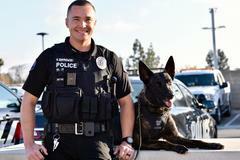 Costa Mesa, Calif. (Jan. 14, 2019) – The Costa Mesa Police Department (CMPD) has restarted the K-9 program and has filled two positions in the K-9 Unit, with one team already deployed. CMPD has been rebuilding over the last couple of years and reestablishing the K-9 Unit has been a priority because of the benefits and elevated service it provides. K-9 Units are a force multiplier and valuable resource for police department personnel on a daily basis. The police service dogs are instrumental in building searches, article searches, and apprehension. Additionally, police service dogs can receive specialized training in narcotics and explosive detection based on the needs of the K-9 Unit. In 2018, CMPD took steps to reestablish the K-9 Unit by selecting its first K-9 handler, Officer Nick Dempkowski. He has been a police officer for the past six and a half years, the past two and a half years with CMPD. Dempkowski’s new partner is Bodi, a 3-year-old, brindle, Dutch Shepherd from Holland. After training, the two officially went into service and began handling calls for service on Dec. 26, 2018. Officer Candyce McMorris has been selected as CMPD’s second K-9 handler. She has been a police officer with CMPD for three and a half years and is the departments first female handler. McMorris is already preparing and is waiting to select her K-9 partner sometime in March 2019, with the intent for them to be in service by May 2019. In 1988, CMPD deployed its first police service dog. Since the K-9 Unit’s inception, there have been ten K-9 handlers and twelve police service dogs, which provided a valuable resource to the department and community by assisting with the apprehension of hundreds of wanted suspects and recovering thousands of pounds of illicit narcotics. In 2011, the K-9 Unit dissolved due to a departmental contraction at the time. Since 2011, CMPD has relied on neighboring police departments to provide K-9 services when needed. We thank those agencies and appreciate their timely response and help when it was requested.